If you build it he will come ! Hope the 1976 Airstream & the man who is rebuilding it! with his father and a voice that is speaking to him about following a dream …Anyway this is not a movie review but as I think about the movie and story line and this little baby sitting in a field of dreams that belong to our friends who we rent our place from I think of this movie. So the voice that Paul hears says let’s rebuild it ! It’s truly a task that is bigger than I can even grasp in my mind! I am gonna just be honest a minute, the movie and situation with Ray the character and Paul my husband are not that far apart. Both men have relationships with a father! I won’t go into all the details of Paul’s but I heard him on the phone with his dad and the response to the airstream was not oh son you can do this or oh son I am proud of you. I know my husband wants to have that time with his dad and he calls and sometimes does not get a response. So I am thinking of this movie and Hope our Airstream and what comes to mind is restoring this airstream is we will not restore it back to it’s original state. All the old things are pulled out and tossed. All the broken pieces are gone and it will be put back together in a new way. It will be just as we see fit. 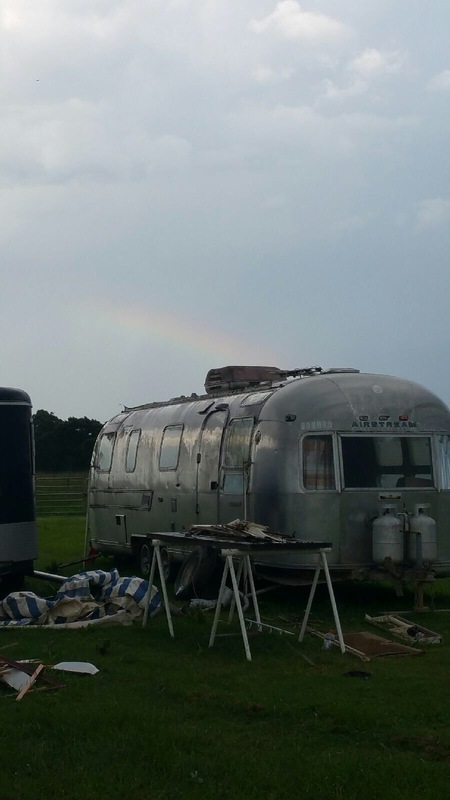 It will be completed and the dream of restoring the past will not happen in this Airstream! We will not live in the past and try to go back! We will build it and he will not come lost chances may not happen and finishing this will not rectify the past wrongs. It will be a the shell of a 1976 Airstream but the inside will be full of peace, fresh life, new vision and many years of joy to us or who ever ends up with her! Sometimes we don’t see the reason things are placed in our path. This is a personal gift to Paul I feel and watching him dream, plan, budget and schedule the work simply makes me happy. Paul may never hear the words he wants to hear from his father, he may never have the relationship he has craved in this life but he does have a Heavenly Father who loves him like crazy and a wife who thinks he hung the moon! He truly is a blessed man and I believe in him! What in your life are you wanting to restore? What old things need to be ripped out and thrown away? What dreams do you have that seem big and impossible ?